What is Infectious Bovine Rhinotracheitis (IBR)? Infectious Bovine Rhinotracheitis or IBR, as the name suggests, is a respiratory disease that is infectious and highly contagious, caused by Bovine Herpes Virus type 1 (BHV-1) which can affect both older and young cattle. It is also known to be responsible for causing abortions, encephalitis and conjunctivitis, as well as respiratory disease and general systemic infections in an affected animal. Its main characteristic is the presence of upper respiratory tract inflammation. Once an animal has become infected with IBR, the virus can never be removed fully. It can remain in a latent state in nerve cells in the brain of an infected animal and can begin to multiply once more if the animal becomes stressed. The reappearance of infection can be detected by excretions from the nose and eyes. Any animal infected with IBR is never again considered safe. The buying and introduction of new animals into a herd is the main source of new cases of infection on farms. 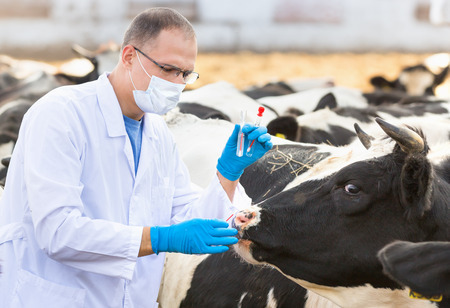 Due to the seriousness of the IBR virus, animals carrying the Bovine Herpes Virus type 1 antibody are not permitted to be exported to countries free of BoHV-1. Neither can they be used by AI centres. The symptoms of this unpleasant disease include coughing, fever, conjunctivitis and nasal discharge, mucosa lesions and increased blood supply or hyperaemia of the mucosae, which can cause redness to the mucosa affected. It can also cause depression and loss of appetite, leading to a drop in milk production and may also be responsible for the occurrence of infertility and abortion. Unfortunately, there is no treatment available for this viral disease. Cows infected with the virus should be removed from the herd and any secondary infections treated with antibiotics and anti-inflammatories. IBR Vaccines are used to control the disease, and as BHV-1 is highly contagious, the recommendation is for calves to be vaccinated when they reach approximately six months old, coinciding with the disappearance of passive immunity in the young animal. The calves should be vaccinated two or three weeks before weaning takes place. This is because the vaccination does not offer maximum protection until about three weeks after it has been administered and calves are most at risk at weaning time. Complete protection for the animal from IBR will not be provided by a single vaccine, but it may reduce the disease’s severity in an animal. It is, therefore, recommended that marker vaccines are used. The reason for this is that the vaccine stimulates an antibody which can be distinguished from the antibody BoHV-1 that follows infection. As with many diseases prevalent among farm animals, implementing and maintaining a good biosecurity strategy can assist in preventing the spread of the IBR virus through the herd. By closely monitoring the health of your herd, identifying changes to behaviour and any obvious symptoms, will allow you to take positive action before the disease takes hold.